For city dwellers that fancy a romp around a classic corn maze but can’t seem to make it out to the country, Richard Serra’s sculpture Sequence is a nice alternative. 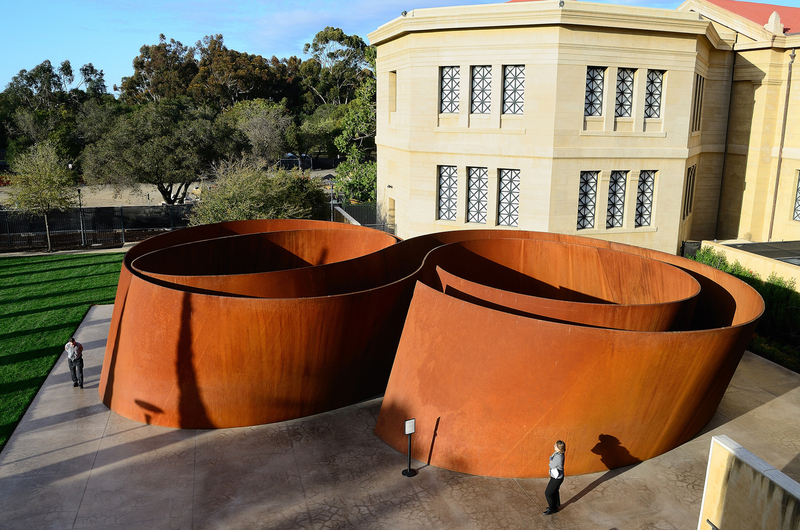 This piece weighs in at a whopping 235 tons and consists of a labyrinth of twisting steel 67 feet long. The journey of this sculpture is almost as long and winding as the piece itself. This sculpture has been moved from New York to Los Angeles to Palo Alto and then finally to San Francisco. Transporting this behemoth requires a dozen flatbed trucks and specialists in rigging objects to man them. Given that San Francisco is the second most densely populated city in the country after NYC, I cannot image what kind of traffic jam ensued when they brought this beauty to its permanent home at the San Francisco Museum of Modern Art, in the heart of downtown. Anyone who has visited San Francisco knows one thing: driving in the city is a nightmarish roller coaster ride. I cannot even fathom how they navigated this baby through the narrow and crowded SF streets. Prior to arriving in San Francisco, Sequence spent three years at the Cantor Arts Center at Stanford University. An entire lawn at the center was ripped up and filled in with 23 truckloads of concrete to accommodate this temporary artwork. While this unsettles my inner environmentalist, at least the sculpture got to temporarily exist in its intended outdoor environment. Placing the steel structure outside allowed the metal to rust from a dark umber brown to the lovely orange peel you see today. Curators at the SFMOMA wished the piece had rusted more in the three years it sat outside but with little rain in sunny California, their dreams were quickly snuffed out. And I thought the ramifications of the drought couldn’t get any worse, now our art is starting to suffer too! Don’t like to pay those museum fees? Well the first floor of the new SFMOMA will be open to the public, so if you’re feeling a bit stingy or times are tough you can still frolic around Serra’s Sequence for free ninety nine. Not a bad deal to see the work one of the masters of minimalist sculpture.